We’ve had quite the cold spell around here and I don’t know what it is about frosty days, but they make me crave a nice warm bowl of chili. I have a batch of my easy one-pot beef chili simmering away on the stove top right now. It’s simple enough to throw together on a weeknight like today and I almost always have the ingredients to make it on hand. 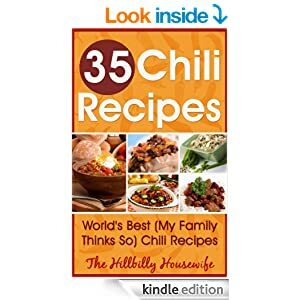 The recipe is from my 35 Chili Recipes – World’s Best (My Family Thinks so) Chili Recipes Cookbook available on Amazon Kindle. I serve it with a batch of homemade tortillas, or a cornbread fresh from the oven. Of course a sprinkle of shredded cheese or a bit of chopped onion never goes amiss either. I hope you enjoy this simple recipe as much as my family does. Here’s a quick tip to make this even faster to throw together. Look for good deals on ground beef and buy more than you need for that day’s meal. Brown the ground beef in large batches, use a portion of it for that night’s meal (Spaghetti with meat sauce for example). Let the rest cool and after dinner scoop it into freezer bags enough for a meal. Freeze the cooked meat for up to six months. When it’s time to cook this chili, throw the frozen, cooked beef in the pot along with everything else. The meat will thaw as the chili cooks. Or you can defrost it ahead of time, but if you’re anything like me, you usually forget. Add the ground beef, some salt and pepper, and onion to a large skillet and brown over medium high heat; drain. Now add the tomato juice, tomatoes (and the juice) and kidney beans. Bring to a simmer and then add chili powder. 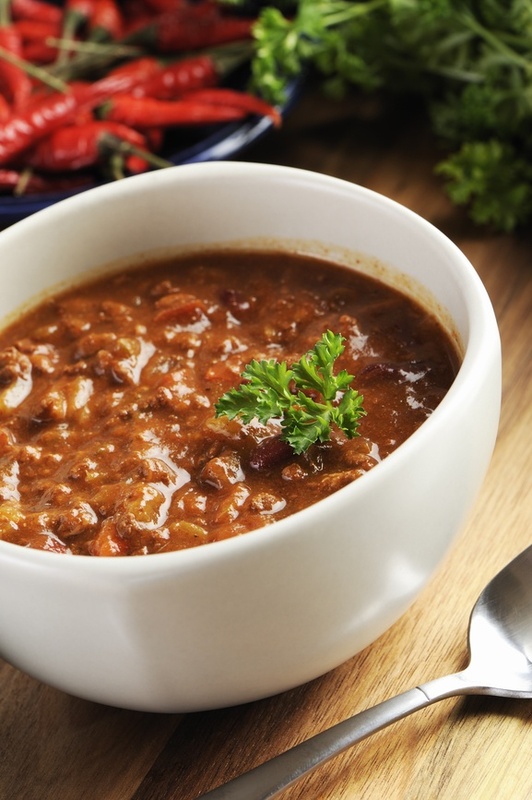 Chili is an easy and versatile dish. You can make it with all different kinds of meat such as beef, turkey, chicken or venison. You can also make it with or without beans. You can also make it as spicy as you like. In other words, it’s a simple recipe that you can tweak to your liking. Download the Chili Cookbook to your Kindle, computer, tablet or smart phone.